Hardy only to about 10 degrees F, though winter mulches or cloches can enhance cold tolerance. 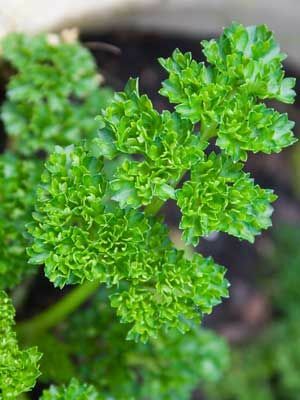 Where winters are mild, parsley can be sown in fall and grown through winter. Sow seeds in early spring, and keep moist. Parsley germinates slowly. Or, start with young purchased plants. Take care not to disturb the roots when transplanting parsley. Gather sprigs as needed in the kitchen. Gather stems for drying in early summer. Colorful parsleyworms sometimes eat parsley leaves. Root rot is common in elderly, winter-weary plants.